Inspired by Kyrie Irving’s go-to comfort food, Nike Basketball is set to release a special edition Nike Kyrie 3 Mac and Cheese iteration. Mac and Cheese is a favorite of many that dates back to baked pasta dishes of 14th century France. Dressed in a University Gold, Game Royal, and Metallic Silver color scheme. 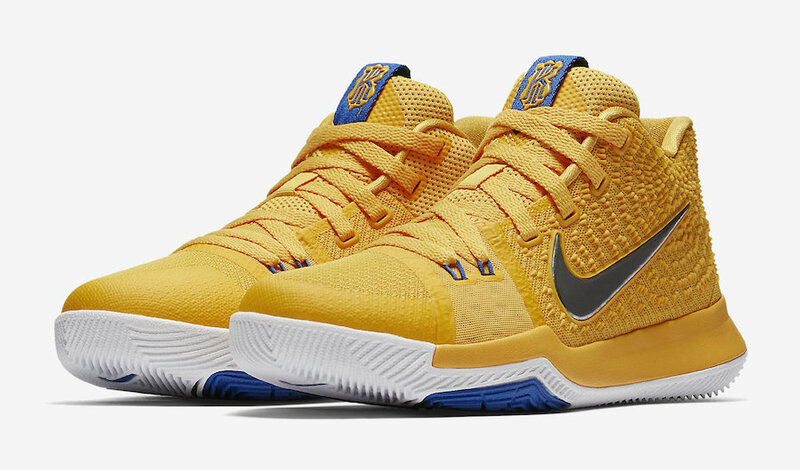 This Nike Kyrie 3 features a Kraft-esque upper fully covered in Yellow with Blue accents. Metallic Silver Nike Swoosh logos on the medial side adds as the spoon or fork – depending on how you eat your Mac and Cheese. But the highlight of the shoe is its insole that displays macaroni noodles graphics. Look for the Nike Kyrie 3 “Mac and Cheese” to release in kids sizing on July 14th at select Nike Basketball retailers and Nike.com. The retail price tag is set at $100 USD.